Lani Phillips who organized the workshop. ALL materials are copyrighted. Please email Dora if you would like to discuss use of any of these materials or descriptions. Thank you for respecting her work. Dora will be available for a limited number of public events through September of 2018 while she works on her next book of poems and manages consulting and coaching commitments with private clients. If you’d like to connect with her to explore bookings, please email her here. Thank you for your patience. News about the next book will be announced soon! Dora will be available for a limited number of public events through July of 2017 while she works on her next book of poems. Dora, as a Sage Institute Board Member, offers this daylong original workshop combining sacred and contemporary poetry, contemplative readings with experiential meditations and exercises to help you explore your connection to the Divine and offers exercises designed to deepen and sustain that connection on a daily basis. The explorations and writings that Dora will guide you through will assist you in exploring the questions deep within your heart, and, more importantly, will support you in listening to the answers, creating space for the truths leading you forward to the life that wants to live through you. Dora has been teaching various versions of this original workshop nationally for over fifteen years and it has emerged as one of her most popular programs. 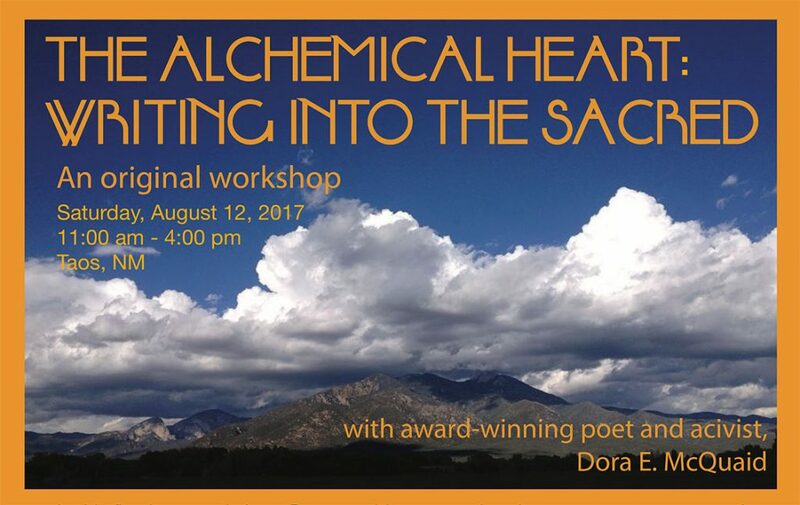 Participants will receive a compilation of sacred and contemporary poetry, as well as an extensive listing of additional resources created by Dora that support further exploration of creativity, spirituality and writing. This workshop is being offered as part of Sage Institute’s 2017 Summer of Creativity and Consciousness programs. Dora has served on the Board of Directors of Sage Institute for over nine years. Download a printable document about this workshop here. There is an Early Bird Special for this workshop of $75.00 if registered up to midnight of Saturday August 5, 2017. After August 5, the workshop cost is $90.00. If you have any questions about this workshop, please contact Dora directly here. Dora is very excited to be offering her favorite workshop and hopes you will join us! During the Spring of 2016, Dora McQuaid will host a workshop in State College, PA, where Penn State University is located, to afford survivors of sexual violence the opportunity to gather as a group for a weeklong intensive writing workshop. Through the Council for Hope and Healing and Happy Valley Cares, Dora will be working with Penn State University student leaders to offer this program. 6. Create a community-wide event for the unveiling and group delivery of the final poem developed through the weeklong workshop itself as a means of raising awareness, strengthening community response and celebrating survivorship, healing and empowerment. 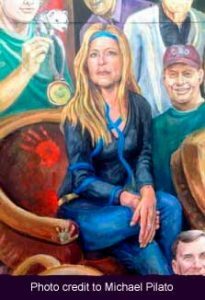 The group poem will be added to the blue ribbon on Dora McQuaid’s image on the Inspiration Mural. Please check back for the workshop dates, which will be posted as soon as we have them determined. Dora will not be teaching privately or publicly during 2015 due to her publishing schedule. Please check back for 2016 Workshop offerings. Dora will not be teaching privately or publicly during 2014 due to her publishing schedule. Please check back for 2015 Workshop offerings. July 24 and July 26, 2013, 5:30 – 8:00 p.m.
Dora, as a Sage Institute Board Member, offers a 2-part exploration of this original workshop, combining sacred and contemporary poetry, contemplative readings, experiential meditations, as well as exercises to explore our connections to the divine and writing exercises designed to deepen that connection on a daily basis. Our exploration and writings will assist you in listening to both the questions deep within your heart, and, more importantly, how to hear the answers, making space for the truths leading us forward to the life that wants to live through us. Hotel Albuquerque, June 14, 2013 10:45 a.m.
As opening speaker for this Annual Convention of the National Federation of State Poetry Societies and representing the NM State Poetry society, Dora offers an abbreviated version of her original workshop to close to two hundred Poetry Society members from all over the United States. 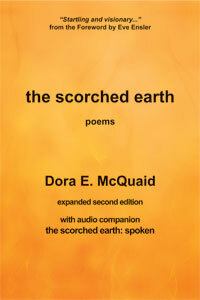 With the primary goal of exploring our connection to the Divine, Dora shares sacred and contemporary poetry and writing exercises designed to deepen and sustain your connection on a daily basis. Our exploration and writings will assist you in listening to both the questions deep within your heart, and, more importantly, how to hear the answers, making space for the truths leading us forward to the life that wants to live through us. Mount Shasta, CA. Sunday October 7, 2012, 1:00 – 5:00 p.m.
Dora offers a 4-hour version of her original workshop, combining sacred and contemporary poetry, contemplative readings, experiential meditations, as well as exercises to explore our connections to the divine and writing exercises designed to deepen and sustain your connection on a daily basis. Our exploration and writings will assist you in listening to both the questions deep within your heart, and, more importantly, how to hear the answers, making space for the truths leading us forward to the life that wants to live through us. Dora offers a 2-hour intensive of this original workshop to over 20 participants in the weeklong Wellness Retreat. The goal of this workshop is to explore how to deepen and sustain your personal connection to the Divine in your daily life as a practice of self-care and support. This workshop will help you understand how to explore the questions deep within your heart, and more importantly how to hear the answers, providing you with exercises that you can use daily. Dora offer her 3-hour original workshop with The Sage Institute Youth Group discussing the power of the personal story in the public realm as a means of change, activism and social justice. A 2-day intensive, original workshop combining contemplative readings, experiential meditations, sacred art forms and writing exercises to explore participant connections to the divine. With Diana Rico. Arts and Activism Workshop: Exploring the use of music as a medium for social and political change in terms of the peace movement, civil rights, gay and lesbian rights, and Native American Indian rights by musicians Michael Franti and Spearhead, U2, Patty Griffin, Elton John and Robbie Robertson. Will also explore how your voice can positively influence your community, and a number of creative writing and poetry exercises. Offered to mentors and mentees in the Youth Mentorship Program and the general public. Creativity, writing and performance-based workshop for 15 teenagers identified as at-risk and served by Project Coffeehouse, a Pennsylvania Council on The Arts granted community program. This is open to the entire community. Through small -group discussion and a workshop setting, PUBLIC ARGUMENT AND SOCIAL ACTIVISM will provide students with opportunities to explore the theoretical, practical, and performative approaches to community-based dialogue, public argument, and civic engagement, and the intersections of private life, performing arts and the public forum. Emphasis is on issues of free speech, civil rights, and the communicative methods used by all manner of activists and dissenters to address social and political issues and inequities. Emphasis is also on the private life experience as both: 1) the motivation to engage in the public, political forum, and; 2) the basis of the messages that are made within the public forum as part of social justice movements. My goal for the weekly readings is to explore the intersections between the general interest of the class members in terms of activism, social justice, and the arts, current community needs, and my objectives for the course. The topics that we will be exploring include the issues of the AIDS Pandemic, the Native American Indian and Latino/Latina experience, and various forms of interpersonal violence (bullying, sexual assault, and dating violence), as well as other topics identified by class discussion during the first two weeks of class. Book-signing to follow in front lobby of The Penn Stater Conference Center. Creativity and Performance Workshop to explore connections between creative process and performative approaches with 27 theatre apprentices. Both workshops I had scheduled were cancelled due to illness. My apologies. However, my latest project, an original photography and poetry show, Along The Path, is now up at Webster’s Bookstore Café. Round Table/Panel Discussion with members of The Neo-Spinsters, including Dora McQuaid, Pat Payne, Reina Prado, and Evie Shockly, exploring collaborative performance process in development of the show Second Wind. Through small -group discussion and a workshop setting, Theory of Social Action will provide students with opportunities to learn theoretical, practical, and performative approaches to community-based dialogue, civic engagement, and to explore the intersections of private life, performing arts, and the public forum. We will explore the arts address of address of issues of race, gender, identity politics, sexual orientation, disability, and the HIV crisis, and individual, community and global efforts to impact these social and political issues. Students will actively participate in the development and practical planning of WORDSTOCK: State College’s Annual Festival of Language, as it serves the public interest by strengthening private, diverse, and collaborative voices across campus and community forums. Empowering The Survivor: Writing as a Means of Healing: A 90-minute workshop offering strategies for outreach service providers interested in developing, implementing and managing a writing workshop for victims and survivors of Domestic and Sexual Violence. Based on Julia Cameron’s best-selling book The Artist’s Way. A String of Words: Poetry and Prose Writing Workshop. Wilmington, DE. May 17, 2004 – check conference schedule for times and locations. A String of Words and Voices Workshop: a 75-minute workshop to explore through writing the creative voices that often get lost in the efforts to meet the demands of our lives. Designed specifically for outreach service providers. Empowering the Survivor: Writing as a Means of Healing: a 75-minute workshop offering strategies for outreach service providers interested in developing, implementing and managing a writing workshop for victims and survivors of Domestic and Sexual Violence. Both programs developed for program-facilitators interested in implementing writing workshops for victims and survivors of violence. Through small -group discussion and a workshop setting, Private Lives, Public Voices will provide students with opportunities to learn theoretical, practical, and performative approaches to community-based dialogue, civic engagement, and to explore the intersections of private life, performing arts, and the public forum. We will explore the spoken word revolution, and the arts address of address of issues of race, gender, identity politics, sexual orientation, disability, and the HIV crisis, and community efforts to impact these social and political issues. Students will actively participate in the development and practical planning of WORDSTOCK: State College’s Annual Festival of Language, sponsored by and offered as part of the Central PA Festival of the Arts as it serves the public interest by strengthening private, diverse, and collaborative voices across campus and community forums. Through small-group discussion and a workshop setting, Private Lives, Public Voices will provide students with opportunities to learn theoretical, practical, and performative approaches to community-based dialogue, civic engagement, and to explore the intersections of private life, performing arts, and the public forum. We will explore the spoken word revolution, and the arts address of address of issues of race, gender, identity politics, sexual orientation, disability, and the HIV crisis, and community efforts to impact these social and political issues. This course will run during second summer session and will coincide with WORDSTOCK, an annual language festival sponsored by and offered as part of the Central PA Festival of the Arts. Students will actively participate in the development and practical management of WORDSTOCK as it serves the public interest by strengthening private, diverse, and collaborative voices across campus and community forums. Based on Julia Cameron’s best-selling books The Artist’s Way, The Artist’s Way at Work, The Vein of Gold, The Right To Write, and Supplies. Civic Engagement on Campus: Building a Center for the Public Good. Short Course developed and presented with Dr. Rosa Eberly. Both workshops are in The Creative Oasis, Beaver Avenue, below The Phyrst. Claiming Voice: Empowerment after the Violence. (2002). Original 2-hour workshop exploring writing and speaking as a means of healing and empowerment. July 2001, throughout downtown – please check schedule for dates, times. Wednesday evenings 6:00-8:30 pm at Dora’s house. Contact Dora for details. Developed course specifically for women survivors of domestic and sexual violence by incorporating exercises for survivors of violence.